I recently made a trip to one of my all time favorite cities… CHICAGO. The week before, I was in Rockford chillin’ with Tracy White. We had just finished organizing The Bladehead Series contest at the Flodin Skatepark in Rockford, IL. Tracy and I decided to make a trip to “Obamaland” before I headed back to Los Angeles. We called up Collin Martin, owner of The Pull, Chi-town’s local rollerblade shop. He invited us to stay with him and crash in his loft. Mr. Martin is a gracious host. We pulled up to The Pull and it looked like a back-alley speakeasy from the ’30s. 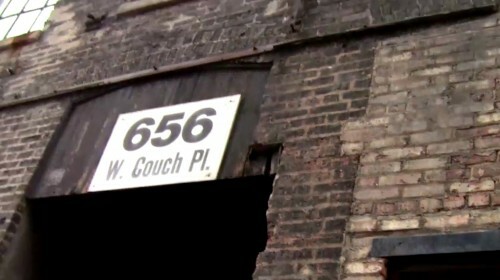 The building is a huge, red brick warehouse, that looks like it was built during the industrial revolution. We walked into this spacious room with a long brick wall on one side, and a Russian constructivism-style mural on the other side. Collin has a photo studio in the corner of the room and a ’50s style refrigerator that we stocked with domestic refreshments. I ended up buying a t-shirt from the $5.00 rack in the vintage clothing section. If you are serious enough, you might want to check out his vintage ties! The set-up reminded me of an old downtown art gallery, with studio lighting and great acoustics. If you’re ever in Chicago you must stop by The Pull! After hanging for awhile we headed out to watch the Bears play. We meet up with Rory Melhan and some of the Chi-town peeps at a local dive, then we rolled out to see some local artsy hipster bands play. We rode bikes around town and ended the night with a sobering 3-mile ride. Overall, I had a great time hanging with Tracy, Collin, Rory and friends. Tracy and I ended the trip with some “olderblading” — we found a few things to mess with in just a few blocks radius. Sorry, NO hammers dropped. Special thanks to Collin Martin for showing us around and taking us into his home. Check out his shop The Pull. Ms Pac man and the Bears forever!!! good thing you both won! Top E.’s the big winner!